Enhancing and Replacing NASA's Space Shuttle: Ideas? Yes. Funds? No. A press conference was held Monday at NASA Headquarters to discuss the results from the recent SLEP (Service Life Extension Program) or "Shuttle Summit" (program) . This "summit" was held over the course of two days last week at NASA's Michoud Assembly Facility in Louisiana. The intent was to look at what it might take to fly the Space Shuttle for up to another two decades. The first day of the event was open to the press and consisted mostly of overview presentations. The second day (not open to the press) was a working session wherein a variety of proposed means to extend the Shuttle's life were discussed. According to a press release "Summit participants heard from seven SLEP panels: Safety, Sustainability, Infrastructure, Aerospace Industry, Performance, Operations and Resources. The panel's recommendations were consolidated and submitted to NASA's Space Flight Leadership Council (SFLC) by the Integration Panel." The timing of this event might strike some as being coincidental - coming just six weeks after the destruction of Space Shuttle Columbia, with an investigation board looking into that accident and still in the midst of its deliberations. According to NASA's Deputy Associate Administrator for International Space Station and Space Shuttle Programs, Michael Kostelnik, this SLEP activity was already in the planning process when the Columbia accident occurred. Kostelnik said that the seeds of this activity can be found in the amendment submitted by the President to Congress for NASA's FY 2003 budget (which included a description of the new Integrated Space Transportation Plan, and follow-on elements contained in the President's FY 2004 budget submission. SLEP is a new name for a process which has been ongoing in one form or another for several years. SLEP includes the previous "Shuttle Upgrade" activities at NASA which have included a variety of improvements designed to enhance the performance, reliability and/or safety of the Space Shuttle system. Given that these three things are interlinked, nearly all upgrades embody a bit of each. One example of an upgrade was the so called "glass cockpit" which utilizes state of the art avionics and displays which was installed in Shuttles Endeavour and Columbia. According to a press release "The SFLC, composed of NASA's senior Space Flight leadership, identified 60 candidate projects, which are targeted at critical service life extension issues, for further consideration. A "Tiger Team" was chartered to prepare an internal submittal within 30 to 45 days to be vetted during NASA's FY 2005 budget process this summer. The long-term strategy will be further refined at SLEP Summit II next year." Kostelnick declined to describe what these 60 candidate projects were, or to provide any detail on any budget numbers that might be associated with them. When asked why this was the case, Kostelnick made repeated mention of the fact that this was due to "lack of staff time" in advance of this meeting. He added that he was working under time constraints as well. None the less, he did describe a process wherein these ideas would be vetted and consensus reached on the final choices. When asked to cite the source of these 60 candidate ideas, Kostelnick said that they had arisen within the Space Shuttle program and that many of them had their origin in the so-called "2020 Study" on extending the life of the Space Shuttle completed under Deputy Administrator Fred Gregory who was, at the time of the study, Associate Administrator for Space Flight. This report (completed a year or so ago but still unreleased) looked at what would be required to keep the Shuttle fleet flying safely until the year 2020. When asked after the press conference if NASA would finally release this report, Kostelnick replied that he thought that this report had already been released and that he would look into this. He was also asked if the Rand Report on Space Shuttle privatization (also completed last year) would be released. He replied, similarly, that he had thought it too had been released and that he'd look into this as well. Of course, despite to activities of the post-SLEP "Tiger teams", the Columbia Accident Investigation Board (CAIB) has yet to make its findings known as to the probable cause(s) of the Columbia accident and any recommendations to fix things. As such, Kostelnik said that which of these 60 candidate items will get implemented will depend on what the CAIB comes up with and the adjustment of priorities that will come from their final report. Many of the items Kostelnick mentioned have to do with longer term issues rather than the nearer term issues that may be associated with rectifying any problems with the current shuttle system so as to getting it to fly again. Kostelnick seemed to be very confident that the CAIB would come back with some solid answers in the next month or so and that he'd have an idea of how any final SLEP candidate ideas would be affected by CAIB recommendations in due course. 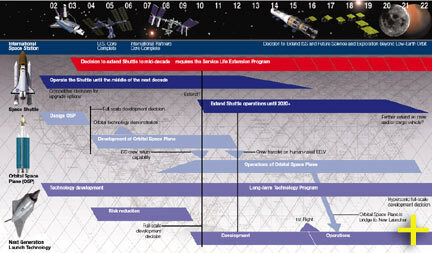 One of the charts (enlarge) shown by Kostelnick is a familiar one - it describes, in timeline form, the new NASA Integrated Space Transportation Plan (ISTP) and how the Space Shuttle, the proposed Orbital Space Plane (OSP), and a proposed Next Generation Reusable Launch Systems overlap. 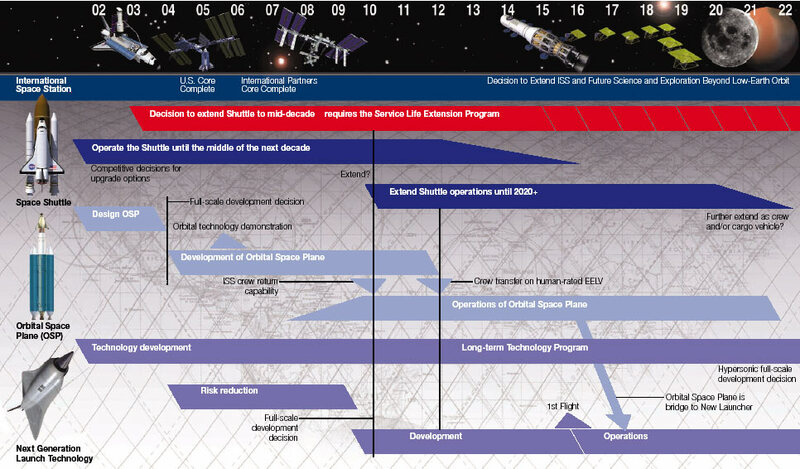 I pointed this chart out to Kostelnik noting that NASA is looking to operate one launch system (Shuttle) in support of the ISS to the tune of several billion dollars a year while entering into development and then operation of two new launch systems (OSP and NGLV). Moreover the there was now some talk of accelerating the OSP and operating the ISS, with a planned 15 year life span, well past that design life - both of which would mean greater costs. Even if NASA decided to discontinue Shuttle flights sooner rather than later, these overlapping efforts (regardless of phasing) would require many billions more than current budget projections show in the offing for NASA. I asked where this money was going to come from since it was no where to be seen in any official NASA budget projections. Kostelnick did not answer my question directly, but instead focused on the part of the picture he actually has some say over: Shuttle and ISS. In so doing he noted such a process involved looking at "what you can do vs. what you should do in real world in a resource-constrained program." He added that some $400 million is dedicated to SLEP. Some of this money goes to current programs such as cockpit avionics and advanced health maintenance but "a lot of this is unencumbered money" he said. Kostelnik said that the OSP was an effort not under his purview and that he could not address cost issues associated with it. I reminded Kostelnik that the OSP and NGLV were on charts we was presenting and, moreover, that much of the rationale underlying the SLEP depended on a system whose tasks were eventually going to be taken over (in whole a or in part) by the OSP. This interaction had a certain familiar ring to it. In May 2002, about 6 months before SLI was overhauled, NASA held a press conference to announce preliminary architecture selections that had been, made by SLI. Indeed were a bunch of concepts that looked a lot like the OSP. At the time I was interested in how the Shuttle System and any new human transportation capability would overlap. "When asked about how the Shuttle and Second Generation launch systems would overlap - and if there was a requirement upon Second Generation architecture to do so, (or if NASA had any firm transition plan) [Dennis Smith, NASA's SLI Program Manager] could not give a direct 'yes' or 'no' answer. Instead, he gave a long answer which, summed up, said that it is good that NASA is doing various studies." "The briefing closed with a question of where the funds for the development of a Second Generation launch system would come from. "Do you have development funds in the 2007 budget?" Smith was asked. Smith answered the question partially saying that "this is a decision that NASA's leadership is going to have to make" and "we do not have the full cost estimates." Smith closed suggested that SLI efforts seek to raise "all boats in the water." In other words there is no funding allocated for the actual development of whatever SLI eventually comes up with. In summary, NASA had an effort underway to look at what it would take to keep the Shuttle going for another 18-20 years while it phased in several new launch systems that would eventually replace some (perhaps all) of the Shuttle's current capability. The new Administrator has demonstrated the ability to get the White House's attention and to gain their strong backing for things when he needs it. The Columbia accident has certainly stirred things up - but only in terms of intensity, not in terms of where NASA needs to go. As a result, some things will be accelerated, some delayed, some changed - but many of the discussions already underway are not at odds with what may come from the CAIB. What does remain unchanged by SLEP, Columbia, CAIB, SLI etc. is the fact that NASA is going to have to ask a skeptical, but now somewhat sympathetic Congress, for a large pile of money - and they are going to have to do it soon. Moreover, the specific requirements and needs which NASA seeks to address with these new systems and monies still remains somewhat ill defined. Much clarity is needed - and it is needed sooner rather than later. Of course, what really remains to be determined is what it is we are going to be doing in space in 2022 as we start to ponder the transportation systems we do - or do not need. The chart in Kostelnik's SLEP program has some fanciful advanced spacecraft and depicts the Moon and Mars towards the right end of the timeline as if to imply certain 'destinations'. Folks, if that is indeed where America's space program will be headed in 2002 we need to get to work on deciding that now - in concert with all of these transportation needs so as to help focus this multi-decadal space infrastructure as opposed to guiding everything in the general direction of 'what if'. Once again, this bears repeating, the specific requirements and needs which NASA seeks to address with these new systems and monies still remains somewhat ill-defined. Much clarity is needed - and it is needed sooner rather than later.